Folks of the modern times might be a bit surprised to see one of Salem's witches gallivanting about in this day and age—grande latte in hand—but hey, we can't blame you for laying low for all these years until the fervor died down. Now that you’re out and about, are you ready to rule this strange new world? Goody! Have you taken a ride share yet? Browsed the web (that’s the colloquial term for the internet)? Actually, scratch that…have you even seen a computer? Read an e-book? Tried satellite radio? No? You better hop to it, girl! For instance, nowadays we celebrate Halloween as a grand affair—a night where we honor the dark sprits with costumes and parties—while fright fests were an everyday occurrence for you. We know costume hunting can be a process of trial and error, so it’s a great thing that you can simply come as you are in this Plus Size Salem Witch Costume. Oh come on, don’t be such a puritan. We know you’ll love strutting around your party in this getup, taking selfies (we hope you’ve gotten a smart phone by now) without persecution, so own it! We modern folks need you to come show us how scream-worthy style is done, since you practically wrote the book on it. 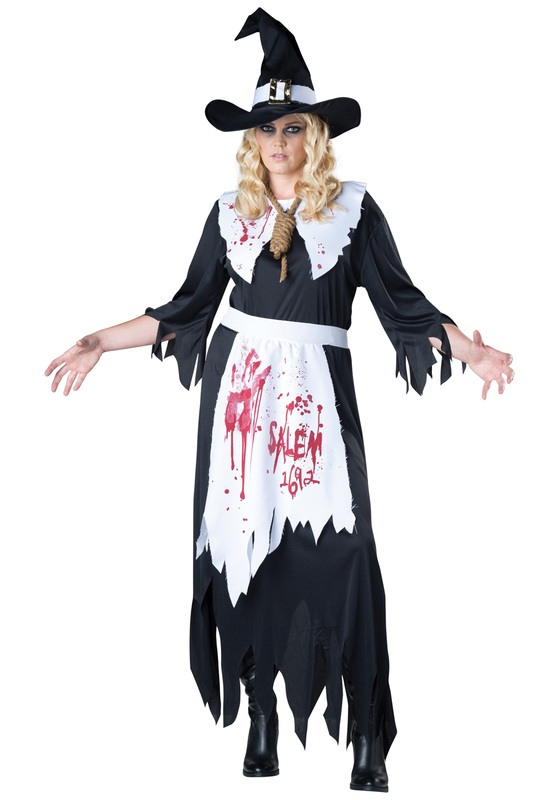 This black frock’s wide sleeves and jagged edges prove you’re one tough cookie from a bygone era, while the blood-stained white accents make you absolutely gore-geous for your first all Hallow’s eve in quite some time. We totally recommend sporting the neck noose and iconic, pointy witch hat that come with this outfit, but if your party includes a bonfire, you may want to stay inside and binge watch a show with your new best ghouls.